I was tipped off to the tragic Slave Lake fire situation by a post on Facebook by a colleague of mine, formerly from Northern Lakes College, who made a comment about the scary images that were coming out of the community. This was shortly after dinner on Sunday, May 15, 2011. Information was sketchy at best but the Twittersphere kicked into gear, taking what little information was available and sharing it with the world. Six hours later and into this morning, Slave Lake was trending #1 in Canada, with thousands upon thousands of messages being hurled into cyberspace about what will likely go down as being the largest physical disaster in Alberta history. Wildfires in the area of this northern Alberta community began several days before, creating thick plumes of smoke as seen in this video posted on YouTube. The scale of the devastation is almost unfathomable as reports on Twitter started identifying buildings that had succumbed to the flames. But it was this image of the new Town Hall that created the gut-level understanding of the scope of the tragedy. The image spread like wildfire being shared, tweeted and retweeted hundreds of times a minute. I sent it to my Mayor and Council colleagues in Wood Buffalo shortly after it first appeared (our community is not out of the woods yet as we have more than several fires burning in our area). 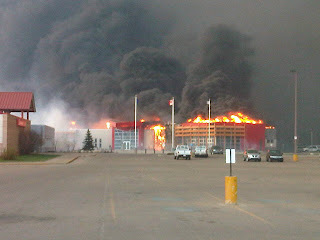 For me, the situation came into emotional focus when I found out that 92.7 Lake FM had burned to the ground. To their credit, their well-subscribed Facebook Group became a lifeline for people looking for information. By that time, Slave Lake Town Hall was gone, and information direct from the local authority was impossible to acquire. Rumours of a mandatory evacuation order of the entire community began mid-evening, at a time when well over 1000 people had already fled. The direction to get out was soon verified and a door-to-door campaign to get everyone mobilized and moving began. Those refusing to leave were to be arrested, as the situation had become completely unmanageable, catastrophic. 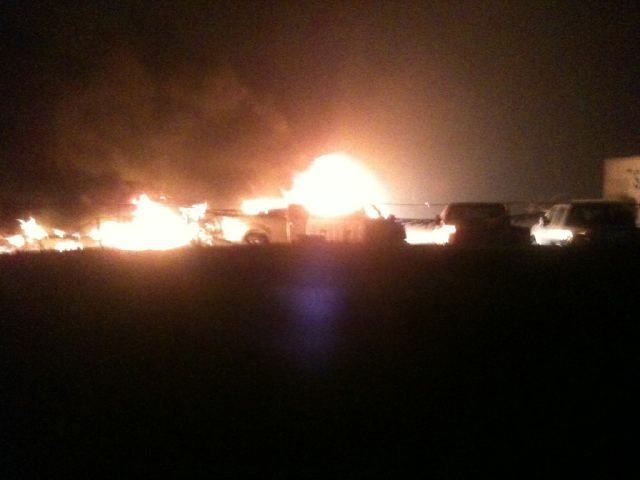 "I hear what I think are explosions at the Ford dealership," posted one person Tweeting live from Slave Lake. "The cars are blowing up, one by one." Frustration and desperation mounted as the order to evacuate rippled through the town, with gas stations all shut down and families who did not have enough fuel to run the gauntlet to safety. Frustration about information flow also started to build as the evening television newscast came and went with nary a mention from our national broadcasters. In this community's moment of greatest need, CBC was sleeping. The best coverage was coming from Sean Amato from CTV-Edmonton and Josh Wingrove from The Globe and Mail. Their reporting was spread virally as the Slave Lake Fire trumped the Survivor Finale and became the biggest social media news in the country. Incredible wind and dry conditions turned Slave Lake into Hell on earth yesterday. An improved forecast and the arrival of hundreds of fire fighters will hopefully bring hope and relief for a town on the brink of destruction. Its just unreal and heartbreaking. Thanks for sharing the information with the rest of us, who were/are wondering if everyone is ok. My thoughts are with my friend and colleagues at NLC. I hope they are safe. Wow, I just woke to my first day on holidays in New Orleans where flooding is rampant and we wait with bated breath that levies will hold as the crest approaches this weekend, only to turn on the news and see that back home an entire city is on fire! I'm sitting here in a state of shock and so saddened for all the people in Slave Lake! What a tragic tragic loss! Though I hear no one has been injured, a miracle inspite of the events. We really are nothing in the face of an angry Mother Nature. My heartfelt prayers and wishes go out to this entire community and never forget you have Alberta Spirit supporting you through this terrible tragedy! Not to diminish the horrible events in Slave Lake, just remembering history..